Fresh berries add refreshing flavor to this light cocktail. Puree strawberries in food processor. Press through a fine strainer or sieve and discard the seeds. Reserve puree. In a large clear pitcher or jar, combine wine with sparkling water and strawberry puree. Chill. 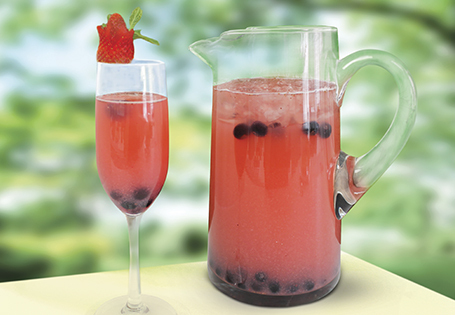 Before serving, add blueberries to pitcher for garnish and several cups of ice per serving pitcher. If desired, place 1 or 2 fresh blueberries in each person's cup/glass before pouring.